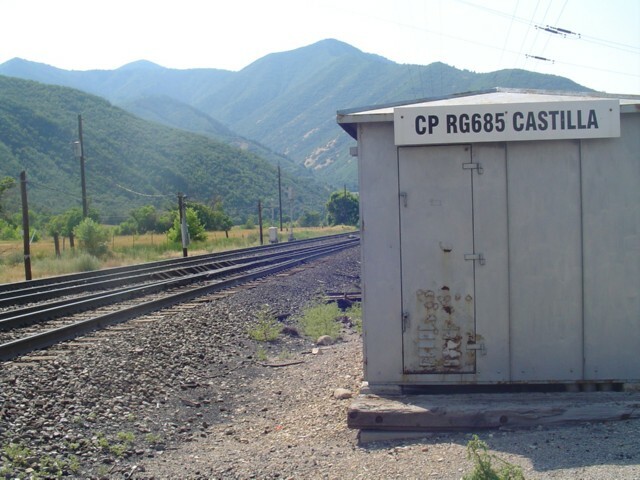 Castilla is three miles up from the mouth of Spanish Fork Canyon. Today the warm water sulpher springs form a swampy area alongside US 6,50. In the 1890′s the springs were the site of a popular resort including a hotel, cabins, bathing, and other recreational facilities. The resort was built in 1891 but was destroyed by fire in 1942 and never rebuilt. The springs were named by early travelers along this part of the old Spanish Trail after the province of Castile in Spain. Spanish Fork in Spanish Fork Canyon, along the north side of U.S.
History,” written by Linda Thatcher (1981). Waters”) because of the hot springs flowing into the river. filed for a patent on the hot springs property with the U.S.
areas, a baseball diamond, and stables were also provided. way to pick up passengers for an evening of dining and dancing. slowed the flow to the springs and the hotel fell into disrepair. The Utah landscape is dotted with hot springs resorts that have come and gone. Although a few remain, most are merely memories to aging Utahns. 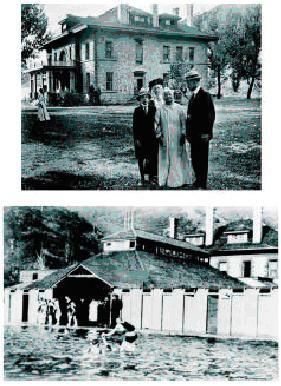 One such popular resort during the 1890s and early 1900s was Castilla Hot Springs in Spanish Fork Canyon, Utah County. The name Castilla was suggested either by the castlelike rock formations nearby or because the Spanish priest-explorers Escalante and Dominguez discovered the springs in September 1776 as they followed the Spanish Fork River down the canyon. They called it Rio de Aguas Calientes (“River of Hot Waters”) because of the hot springs flowing into the river. In 1889, more than 100 years later, William Fuller filed for a patent on the hot springs property with the U.S. government. On the land he built a small house which contained a wooden tub for bathing in the mineral water. Later, the Southworth family became interested in the property. Mrs. Southworth, the family matriarch, felt that her health had been improved by bathing in water from the springs. She urged her two sons, Sid and Walter, to buy the springs to “make a resort for people who have hopeless afflictions, that they may come and be cured.” The Southworths obtained the land from Fuller and began to improve it. They filled the swampy area with gravel and built a three-story, red sandstone hotel. Other structures included indoor and outdoor swimming pools, a store, a dance pavilion, private bathhouses, several private cottages, and a saloon. Picnic areas, a baseball diamond, and stables were also provided. During the summer months the Denver & Rio Grande Railroad ran excursion trains to Castilla. 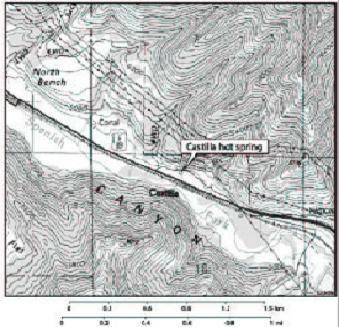 One of the most popular runs was the “moonlight excursion” from the Tintic Mining District in Juab County to Castilla. The train stopped at stations along the way to pick up passengers for an evening of dining and dancing. In 1912 Sid Southworth died. Noted sculptor Cyrus Dallin, a native of Springville, helped his sister Daisy (Sid’s widow) financially with the resort. Eventually, he gained controlling interest in Castilla, but he had to rely on relatives to run it as he lived in Boston. The resort enjoyed a brief renewal of popularity in the 1920s, but by the 1930s it had fallen into disuse. Lack of funds and competition from other resorts contributed to its downfall. In the 1940s a fire destroyed most of the hotel. What remained was eventually torn down. Today only a few ponds created by the springs mark the spot where the once-thriving resort stood.